Apparently, the fact that my husband and I are from different planets has escaped no one. "You married a white boy!" a high school pal exclaims in an email after discovering my wedding photos online. Later, my grandmother peers into my husband's blue eyes while watching our wedding DVD and repeatedly asks me, "Why did he marry you?" I tell her simply, "I'm Jewish now." I am descended from Caribbean natives, African slaves, Spaniards and FrenchmenBut "I'm Jewish now" doesn't really explain how G‑d, in His infinite wisdom, brought together a Dominican American girl from New York City who grew up on welfare checks and an Eastern European mutt (some Russian, some this, some that) who grew up in Los Angeles five minutes from Beverly Hills. Or maybe it does? We have come to Judaism from different worlds. I didn't convert until I was an adult. My husband was raised in a Modern Orthodox home. I am descended from Caribbean natives, African slaves, Spaniards and Frenchmen who practiced Santeria, voodoo and Catholicism. He is descended from a long line of rabbis in whose footsteps he follows today. While on one side of the mechitza, I struggle to keep up with the Hebrew prayers, my husband is on the other side rereading the speech he is scheduled to give to the entire synagogue that Shabbat. Honestly, I didn't even understand my husband when I met him. Looking back, I realize that our first connection was Judaism. I wanted desperately to learn about it. And my husband loved to teach anything and everything about it. Things were simple. Until we began to focus on all the ways we were disconnected. To begin to really understand each other, we tried to learn more about how we had become the people we were when we met. Our journey took us far and wide before we ended up back at the beginning. We visited both Los Angeles and Israel together, the places my husband called home. I basked in the dry heat of both, stunned by how much nicer Angelinos were than New Yorkers. And in Israel, he took me on my first ever road trip: from the holy places of Jerusalem to the Roman ruins of Caesarea. My mouth never closed from the awe. I realize that our first connection was JudaismWe planned a honeymoon to the Dominican Republic. But it was more than a Caribbean vacation. It was the first time my husband saw the place where my family emigrated from and where much of my family still lives. Together, we learned about my ancestors. And while we were there, we also taught my family about how we live our lives Jewishly. The whole family gathered at my uncle's supermarket in Santo Domingo to help us on a shopping spree. Together, we raced down the aisles turning items topsy-turvy in search of kosher products. We met in Washington Heights, the neighborhood that I grew up in. And on one sunny Shabbat afternoon, I took my husband on a walking tour of the neighborhood. "This is where I went to Sunday school." The start of my journey to Judaism. "This is the building we made fun of growing up." And we smiled at each other because it was the same building where we met. Seeing the neighborhood through my eyes, seeing it through his, helped us to slowly learn to speak the same language. It took us about a month of being married to realize we didn't speak the same language. "Give me some water," I told him. "Please? What are you ordering me around for?" he responded in a huff. "Yea, it's in the fridge," I'd offer back without bothering to look up from my book. And we would end up glaring at each other, neither of us quite sure where the communication had collapsed. And those were just our minor struggles when we were both speaking English. Learning about his roots has opened up a new world to meDuring a class at the synagogue, my husband sits next to me whispering translations for the Yiddish and Hebrew peppered in amongst the speaker's English. But still, as the speech continues, I grow more anxious and feel more excluded. By the middle, I'm ready to tune the whole speech out because the language barrier overwhelms me like an artillery assault on my self-esteem. That's when my husband gives me a loving look. Suddenly, I feel less alone. And he never stops whispering in my ear. Every year, I scowl when "time constraints" threaten to force a speedy jaunt through the Haggadah on Pesach. I want to read every word. To languish in these words that he can read by heart. They remind me of the painful journey I had to take to arrive at my Jewish present (and future). My husband grimaces at my scowl. He is leading the reading, surrounded by his family members and his childhood memories of this yearly event. He appreciates the same experience because of how it connects him to his heritage, his religion, his family history. We're two Jews with diverse pasts coming togetherWhen our eyes finally meet over the table, we connect. We make sense. We're two Jews with diverse pasts coming together to build a life together that uses Judaism (and love) to bridge all the gaps along the way. "Vamonos," he announces to me at the end of every Shabbat meal. It means "let's go" in Spanish. And every time he says it, it makes me smile. Growing up, Spanish was my special language. It was the language our parents and relatives spoke to us at home. It was the language my sisters and I used to hide from English speakers. Now, it's the language my husband is learning to better understand me, my culture and those secretive conversations I still have with my little sisters. He reads with the energy that a child uses to play with a newly discovered favorite toy. The same energy he sees in my eyes when I learn more about Judaism. Teaching my husband about Dominican culture has taught me to love myself and where I come from. I have learned to appreciate what I once overlooked because he teaches me to savor these things. And learning about his roots has opened up a new world to me, a new future that becomes less foreign when we face it together. Three years later, we are still learning to meet in the middle… by tutoring each other. We practice talking the way the other person does. We try to see things from the other person's perspective. We have to explain things to each other explicitly (sometimes, through gritted teeth). After years of stumbling in the dark, we've established two ground rules: Never make assumptions. And things don't always mean what they seem. I learned to understand statements that were fired at me in the form of question. "It's the polite way," he'd say. "No, it's the way you were taught," I'd correct. He had to learn to be more specific. "Rude, you mean?" He would ask with exasperation. "No, just blunt," I'd say. And I'd add with a smile, "I can take it." We serve rice and beans – a staple of any Dominican mealToday, our Shabbat table looks a lot like our marriage. 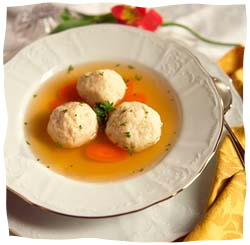 Everything we serve is kosher but strikes our guests as unexpected. We serve rice and beans – a staple of any Dominican meal. But it is my husband who makes them, despite the trouble he has pronouncing their Spanish names. Sometimes, we serve gefilte fish, as his Polish grandmother still does. But it's me who throws it in a pot to boil. Stumped for side dishes, we decide on maduros, the sweet yellow plantains my mother used to make. We blend together what we love best about our cultures, consciously and subconsciously making decisions about what matters most and what doesn't. "You guys are just so different," a friend offered recently with a laugh after she heard us discuss roller coasters, which my husband hates and I love. My husband and I smiled at each other. Because we have come to realize that for all our differences, there are a couple of important things we have in common. On that short list of things my husband and I have in common is Judaism. Judaism is our life on a day-to-day basis. It is our value system. We have both chosen to center our lives around it. And when we make our choices, our decisions, it always comes down to the fact that what matters most is our Judaism and everything we decide has to work with it, not against it or around it.Without it, we wouldn't have found each other. We may be the face of multiracial, multiethnic, multicultural identity. But really, we're just two people in love and we are truly bashert, truly soul mates. Thank you! This helped me perceive a much better grasp. Loved the article! Different yet the same. From the comments it looks like this was written just when my husband and I met. If I'd read it then I never would have believed it would describe our day to day life and struggles. At our engagement party the women who introduced us said if she had known our parents she would have known for sure it was meant to be. Our parents look the same, sound the same and came from the same place. All that seemed easy enough until it came time for us to start our life together. Your description of learning how to hear and speak to each other is every bit as true for us as if we'd grown up speaking different languages, and we've come to realize we did. Different languages in the very different cultures of our two families. I love how you describe tutoring each other about your lives. We will have to try that, and hopefully take some tips from your life, to help build a bridge in ours. Wonderful~ Que bien, chica! I am from Argentina and often wonder how this will affect the future of my future husband and I...and when I read what you wrote I realized....the right one will be ok with it and be accepting and caring. Gracias....B'H! Thank you so much for this article. As an Ashkenazi Jewish Social Worker who has worked in Chicago's Hispanic neighborhoods, I can appreciate what it is like to straddle two different cultures. Your children will be enriched by their exposure to both of them. Please consider teaching them Spanish. It will open many doors for them. D-os te bendiga. communication Aliza, your story was a pleasure to read. Your writing brought us right into your heart and your home--may Hashem bless you with ever increasing success in your marriage, your writing, and whatever else you choose to pursue. Misunderstanding of Ethnicity If your husband is an Ashkenazi Jew (which you implied), then he is not an "Eastern European Mutt". Ashkenazi Jews have surely intermarried on occasion, but they are a distinct ethnic group with distinct genetic signatures that are easily identified through simple DNA testing. Misuderstanding of Ethnicity If your husband is an Ashkenazi Jew (which you implied), then he is not an "Eastern European Mutt". Ashkenazi Jews have surely intermarried on occasion, but they are a distinct ethnic group with distinct genetic signatures that are easily identified through simple DNA testing.